$25.00 (not including shipping) or more! 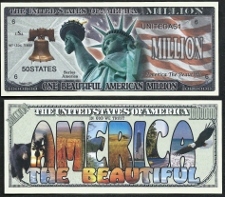 We offer a wide selection of Novelty/Commemorative bills. 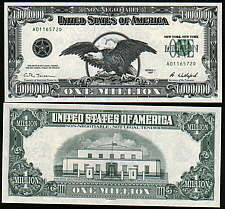 Many of the bills are available at wholesale prices. The Novelty Notes produced by us all have the copyright KADS88 on them. KADS88 has been our ebay name for almost 20 years and represents our family owned company. E-mail us at kads88@mchsi.com if you have any questions. Shipping within the US is only $2.50 regardless of quanitity ordered. US orders over $50.00 are always sent USPS Priority Mail. International orders are welcome, shipping price is calculated on the value of the of the order. 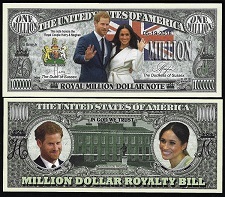 None of these collectable bills are legal tender in ANY Country! You can use the search function above to see if we have any bills related to your interests OR you can check out all of the bills we carry by selecting the categories below. Click on link above to check out what is Featured TODAY! 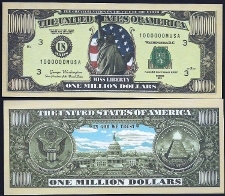 These are bills may include any type of bill we choose to offer special pricing. These items will be changed periodically. 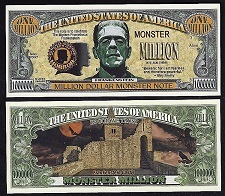 We intend to include some seasonal items for Holidays along with other bills. Pictured below are just a few bills in this category. Click on link above for MORE! 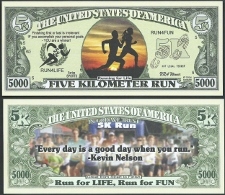 For anyone interested in purchasing larger quantities we have competitive pricing for Lots of 500 or purchasing multiple lots of 100 Bills. Great for resellers in the Retail or at Flea Markets. The Novelty Notes produced by us all have the copyright KADS88 on them. KADS88 has been our ebay name for almost 20 years and represents our family owned company. 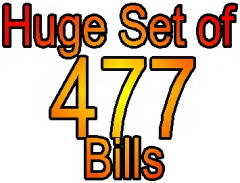 Click on link above to check out what bills will not be around long! These are bills may include any type of bill we have decided no longer stock. 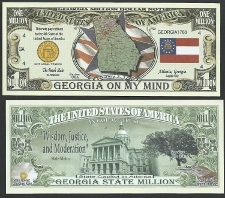 Once these bills are gone they are GONE! 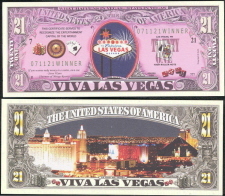 They have been priced lower than any other bills on our site. Pictured below are just a few items in this category. Click on link above for MORE! 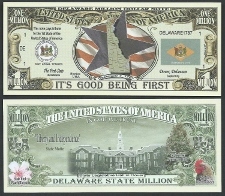 These are bills that have recently been released. 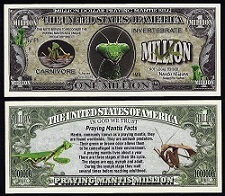 These bills are also included in the appropriate category below. This category includes sports, recreational activities and events that are fun to attend. From household pets to endangered species this category includes many living creastures..
Look back at US History and remember all of the leaders of our great country! 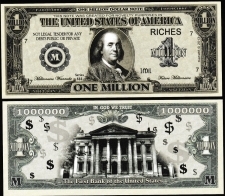 All of the bills are the same size as US Currency. This category commemorates a wide variety historical events. Not only traditional holidays we also have included special occasions people celebrate in this category.. 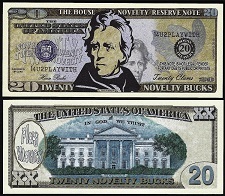 These bills are all whimsical or entertaining. Bills to honor those who protect and serve our great nation. Both supportive and satirical political bills are included in this category. Notorious historical criminals, Great people influenced the world and recognition of various professions we should honor today. 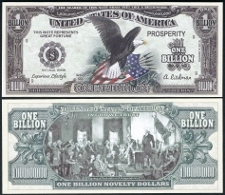 These are bills that feature various places within the Universe. 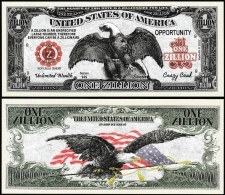 Premium bills were printed in limited quanities and have special features on them which can be seen with an ultraviolet light, also known as a black light. Many also come with a certificate of authenticity. 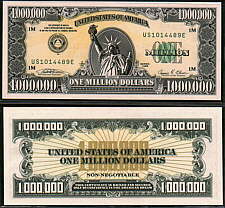 Pictured below are just a few bill sets in this category. Click on link above for MORE! For the best value check out the sets! 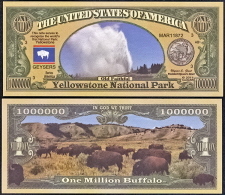 Each set contains one of each bill listed in that set. Shipping is still only $1.00 to the US!! 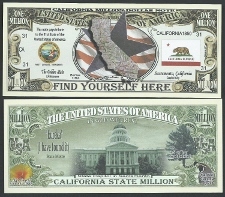 Pictured below is one of the sheets available in this category. Click on link above for MORE! 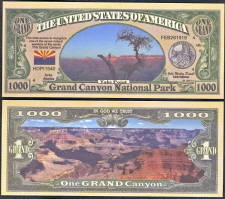 Uncut sheets of novelty bills. All of the sheets are individually number and signed. Include in ALL Greeting Cards! There is something for anyone you can think of! !